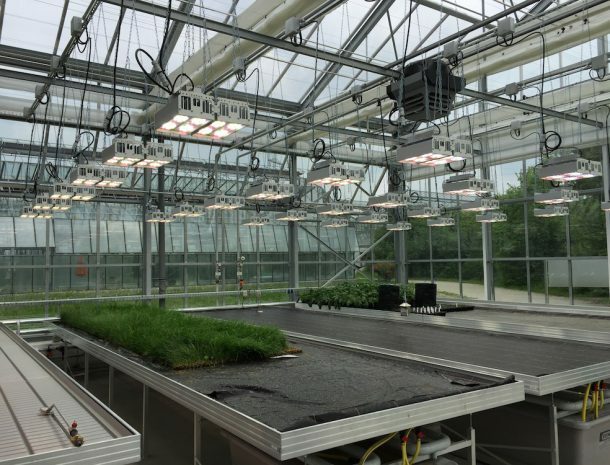 Crop protection companies, specialized in developing herbicides, fungicides and insecticides for agricultural crops benefit from advanced LED lighting that develops strong, vital plants in indoor conditions. These herbicide and metabolic studies demand outdoor conditions to be replicated in greenhouse or growth room settings. The key element is light which contains colors from the entire light spectrum, including outside the PAR area.Valoya has developed advanced LED lighting such as its proprietary NS1 and NS12 spectra, specifically for these purposes. The spectra in question are a close sun match and appear white to human eyes enabling researchers to spot the smallest of differences on plant leaves and stems ensuring a precise visual inspection. The sun-like appearance of the spectrum, combined with the upward heat radiation enables natural behavior of desired insects (bumble bees or bees) and undesired ones (aphids, thrips etc.). Valoya’s crop protection LED technology is specifically designed for professional use and can thus be used in extreme conditions such as in fungicide research which often requires high moisture levels (90-100%). These advanced LED lighting luminaries have a high ingress protection rating (IP) and can therefore withstand such conditions. The close match to sunlight (ASDM) enables plants, insects and mites to obtain photons of a wide range of nanometers incl. some UV radiation. More constant and comparable conditions in darker months or controlled environments with results obtained outdoor, under outdoor field conditions. The blue:green (B:G) and red:far red (R:FR) ratios adapted to clear sky conditions during spring and summer to fit almost all plant species on earth. Heat emission upwards for better control of temperature and humidity at plant level / canopy. Less heat input in controlled systems for energy saving. Better quality of tests which improves repeatability.